Earn $4.49 in Podium Club credit (449 points)What's This? The Rubino Control is a folding tire with a very robust construction, capable of handling the worst of road conditions, without sacrificing the performance the Rubino range is known for. With full bead-to-bead tread wrap, cuts and punctures are dramatically reduced, and are reinforced with the PRB anti-puncture layer inside the casing. 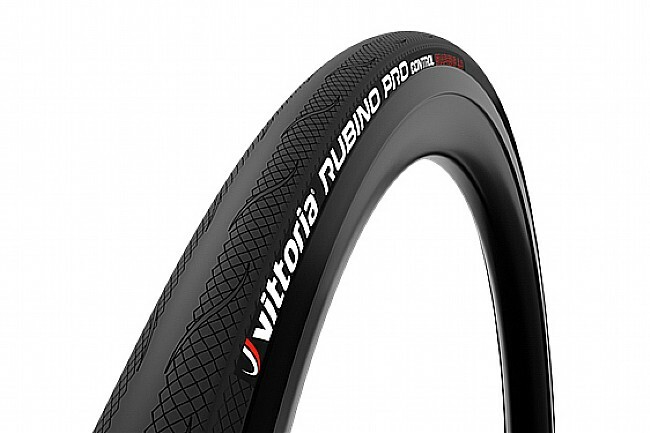 The Rubino Control also shares the exclusive 3C Graphene compound structure, long service life, puncture protection, sharp handling traits, and lightweight folding bead material of the Rubino Pro. Reinforced sidewall for durability and puncture resistance. Specific Nylon casing designed for last-longing durability. Functionalized GRAPHENE 2.0 ensures high puncture protection in wet conditions. 3 compounds in the tread (3C) for increased wear life and increased performance.